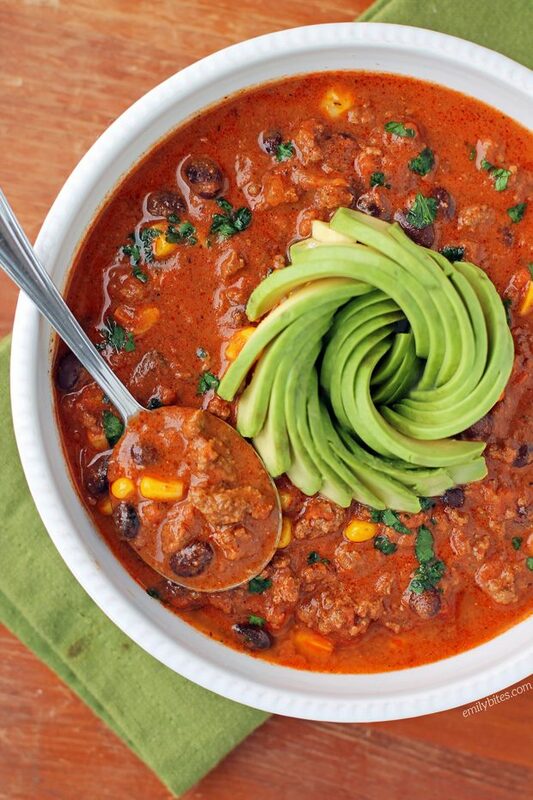 This Beef Taco Soup is a filling, flavorful and super satisfying one-pot meal. Rich and tasty with a little kick, this soup is packed with lean ground beef, sweet corn and hearty black beans. This soup is fantastic on its own, but you can also easily customize it with your favorite toppings like avocado, cilantro, shredded cheese, sour cream, green onions or crispy tortilla strips. A generous cup of the soup is just 253 calories or 4 Weight Watchers SmartPoints, saving you room for toppings, side dishes or dessert! 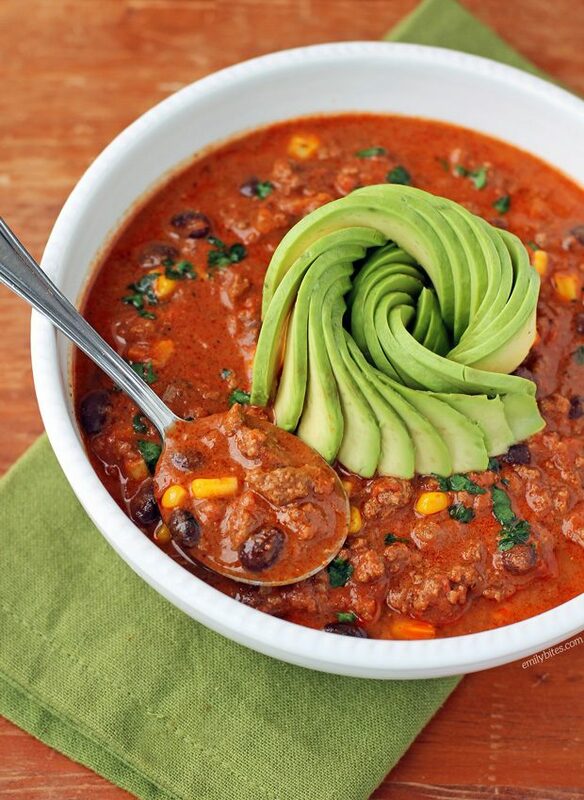 I found this Beef Taco Soup reheats really well so it’s also perfect for lunches! Since my Sausage and Tortellini Tomato Soup has quickly become one of my most popular recipes, I actually based this Beef Taco Soup off of that dish. You’ll notice the procedure is very similar, just with a taco twist! I hope you all will love it just as much. I do want to be clear that while the soup is topped with avocado in the photos (because it’s pettier and shows you an option for garnish), the avocado is not included in the nutrition info or points calculations below. If you want to make your own pretty avocado roses, it’s super easy! There are tons of tutorials online. Looking for more tasty, hearty soup recipes? Check out my Sausage and Tortellini Tomato Soup, Butternut Squash Soup, Creamy Chicken and Wild Rice Soup, Zuppa Toscana, Broccoli Cheddar Soup, Slow Cooker Beef and Barley Soup, Italian Wedding Soup, Cheeseburger Soup, Spaghetti and Meatball Soup, Buffalo Chicken Soup, Chicken Tortilla Soup and more in the soup section of my recipe index! Other optional toppings (not included in nutrition info or points calculations): avocado, shredded cheese, sour cream, tortilla strips or chips, sliced scallions, etc. Combine the chili powder, garlic powder, onion powder, crushed red pepper, oregano, paprika, cumin, salt and pepper in a bowl and stir to combine. Set aside. Pour the canola oil into a soup pot or Dutch oven and bring over medium-high heat. Add the onions and stir to coat. Cook, stirring occasionally, for a few minutes until the onions are softened. Add the minced garlic, stir together and cook for another 30-60 seconds. Add the ground beef and stir together. Cook, breaking the meat up into small pieces, until the beef is cooked through and fully broken up. Add the spice mixture from step 1 to the meat and stir to coat. Add the broth and crushed tomatoes, increase the heat and bring to a boil. Once boiling, reduce the heat to low and simmer, covered, for 20 minutes. Uncover the pot and add the cream cheese. Whisk the cream cheese in while simmering until the cheese is dissolved. Add the corn and black beans and stir together. Cover the pot and simmer for an additional 10 minutes. The soup looks great. We love the sausage tortellini one so will definitely try this one. And that sliced avocado? Perfection! Long time reader, 1st time commenter: This soup looks delicious but what made me stop to comment was that avocado slice game-ON POINT! Thanks for all the yummy recipes! Emily – how on earth do you get the Avocado to look so beautiful?! I am impressed. Looks great- on target for lunches in two weeks. Thanks! Do you have any suggestions for chili powder replacement? I’ve made the sausage soup and the chicken chowder and omitted the spicy ingredients both times, since they were teaspoons, however the chili powder in here is tablespoons. Please let me know if you have any ideas! My family and I love your recipes! Thank you! This was DELICIOUS!! Made it tonight. My husband and I are still enjoying it!! Soup is never my forte for making or eating, never mind trying to make weight conscious soups. Thank you for this very tasty yet WW friendly recipe. Truly one of the best soups I have ever made thanks to you. I seriously cannot focus on this recipe because that avo-rosette is calling to me! So so pretty! I want to try this with chunks of flank steak instead of ground beef. What do you think? I switched up the recipe a bit because the store had a special on ground chicken breast. I used 2 pounds of ground chicken breast and 4 cups of chicken broth instead of beef. Everything else I kept pretty much the same. So good! Thanks! Is there sausage in it? The recipe instructions mention sausage. Made this it’s really good..
Made this tonight, delicious! We crumbled some tortilla chips on top. Every time I cook one of your recipes I am so pleased with the results! I LOVE THIS. Tacos are a favorite in my household, what a nice way to switch up the methods and still get GREAT FLAVOR. Honestly, you are so talented! Made this soup and its delicious. Even better and spicier as leftovers! DELICIOUS!!!!!! My husband really liked it and couldn’t believe it was WW friendly…. Some additions because i wanted to bulk it up a little more: 1 zucchini,chopped, 1 red pepper,chopped, 1 poblano pepper,chopped, 6 crimini mushrooms, sliced… It was soooooo good!!! Love Emily’s recipes! have lost 56 lbs with the help of these delicious recipes…. Will you be writing a cookbook???? You should…. Thank you so much for your help! Could this recipe be cooked in a crock pot?